While hundreds of CRM metric systems have evolved over the years, guests have been inundated with hotel survey requests that are lengthy and antiquated. Recently, with the extensive research conducted by loyalty expert Fred Reichheld, it has been found that brands are best served when they distill the whole process down to one simple question: "Would you recommend this hotel to a friend?" 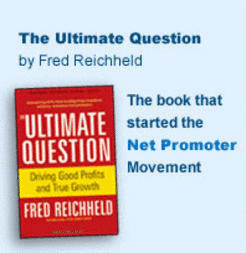 Outlined in his book, "The Ultimate Question," Reichheld found that companies could distinguish "promoters" from "detractors" to produce a clearer picture of an organization's performance from its customers' perspective. His extensive use cases actually proved that increasing a "Net Promoter Score” or NPS by merely a dozen points or so, over the competition, could double a company's growth rate. 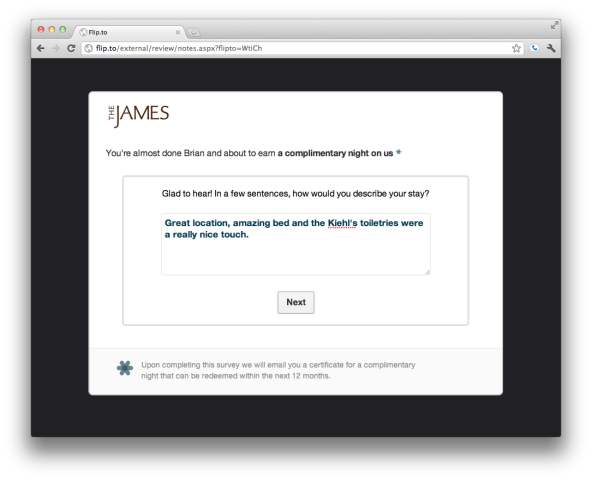 After a guest’s visit, Flip.to sends out an email asking for a quick review with a unique URL and an incentive as thanks for the two minutes it takes. 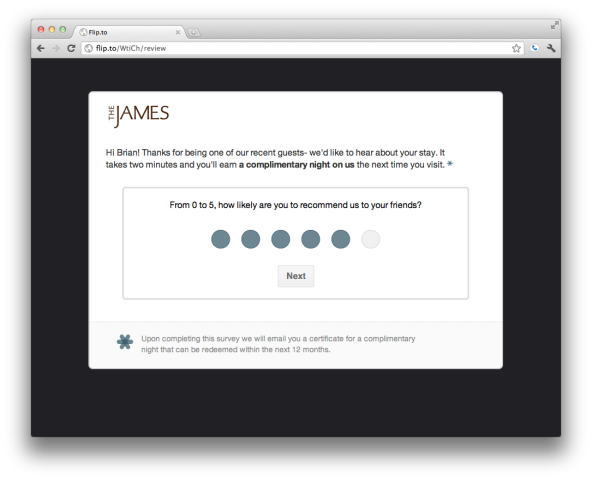 The first question is “how likely are you to recommend our hotel to your friends?” If the score is above a certain threshold, Flip.to now knows that this guest is a “Net Promoter”. Next up, Flip.to asks for a short quote from the guest that sums up their stay. This is feedback that the hotel can use to reach back directly to guests who have had a negative experience, with the hope of getting another shot at their patronage in the future. 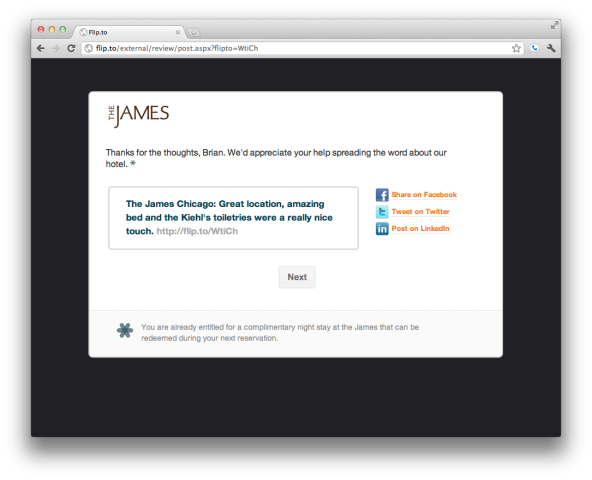 If the feedback is positive, Flip.to encourages the guest to spread the word to their friends, relatives and colleagues. A branded message is passed along with a link back to the hotel’s website that is personalized for each guest, which includes their quote. 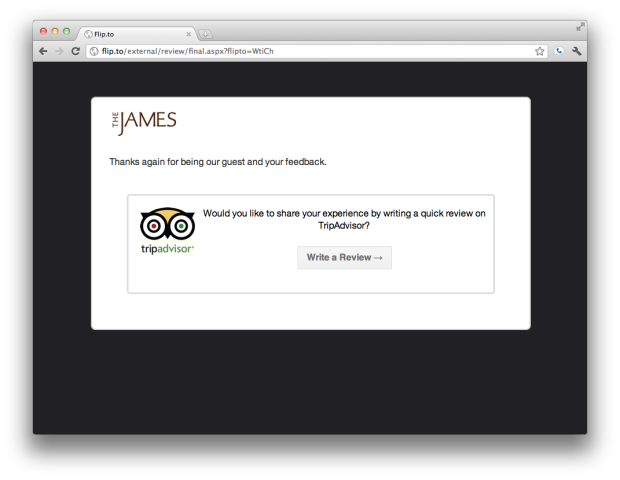 After posting to their social networks, happy guests are directed over to share their thoughts on TripAdvisor with a link to the hotel’s review page. 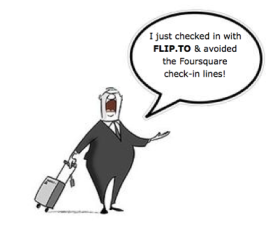 Flip.to has rethought the antiquated review process and turned it into something that’s personalized and quick for quests and a tool that helps hotels identify their “Net Promoters”- the folks that are the absolute best marketers of any property.